This is undoubtedly my worst time of year – and can really only be described with one word – bleak. Everyone is partied out after the festive season, and generally skint as a result, spring isn’t here yet – and the grey days bleed into one another with a monochrome chill. I exist through the days with an almost permanent frown on my face – and like an angry bear all I want to do is hibernate until spring breaks with the bright yellow daffodils. The grey filters through from the wintry weather to the available food – and for these few months before spring the fresh produce lining the shop shelves – locally anyway – is bland and somewhat limited. 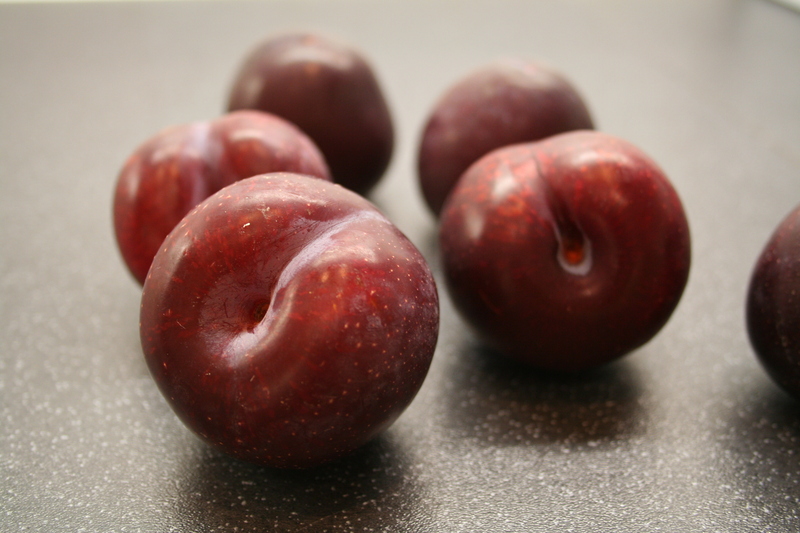 So when I walked into the supermarket after work today and found deep purple plums from the South African summer I could not resist them. This is my little bit of sunshine and colour in the bleakness – and perfect for my mother’s yoghurt cake. She made this cake as far back as I can remember. For any and every occasion. It is quick, easy, fool-proof, versatile and delicious. As I type this I can hear her saying, “Anyone cake bake this cake – it even works when baked in ovens that don’t work properly”. 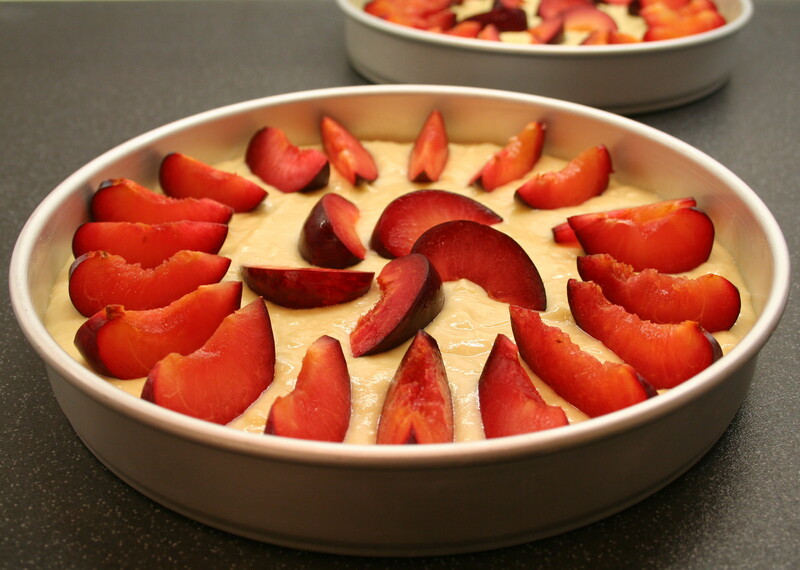 You don’t need to use plums either – you can layer pretty much any fruit you like on the top of this cake – peaches, apricots, and blueberries work particularly well. 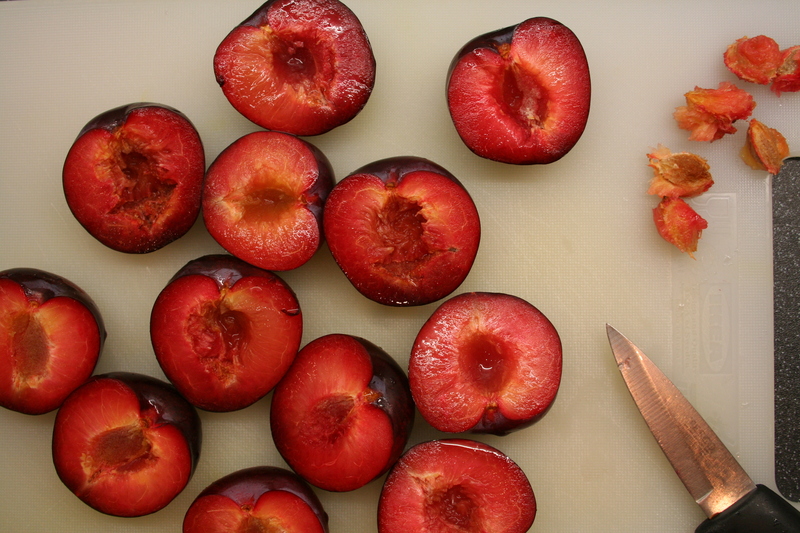 Or, you can leave the fruit out all together and instead mix in raisins or nuts or chocolate. The only two rules to follow when baking this cake are – use a shallow baking tin (traditionally my mother made this cake in a rectangular yellow enamel tin) and don’t over mix the dough. Preheat the oven to 180°C (160°C for fan oven). Grease a large rectangular baking tin, or two round 8 inch baking tins with butter and line the bottom with baking parchment. 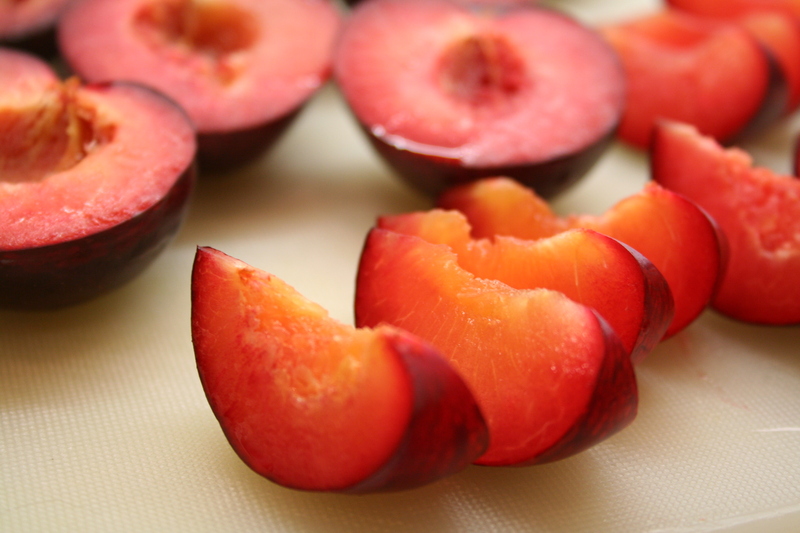 Wash and slice the fruit as desired – you can either halve the fruit or cut it into smaller slices as I have here. 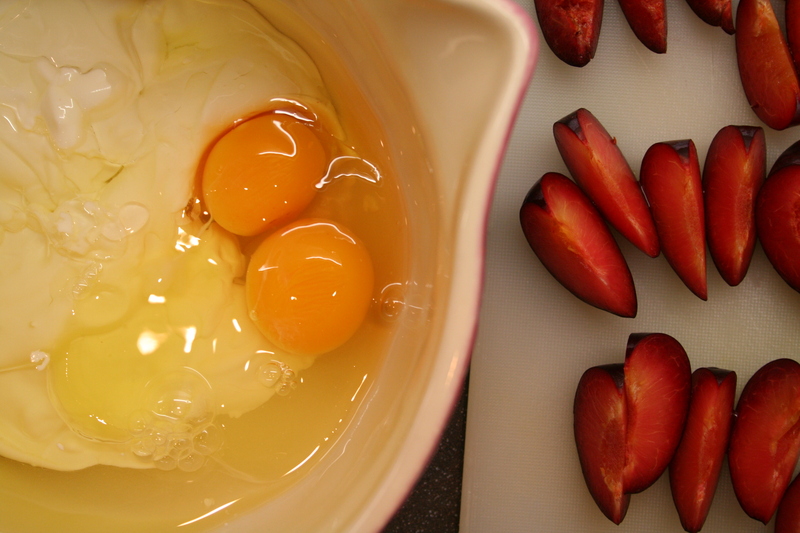 Place the sugar, oil, yoghurt, eggs and vanilla in a bowl and whisk to combine. Sift the flour and baking powder into the mixture and fold in until just combined. Do not over mix, and don’t worry if there are small lumps – these will disappear when baked. Lay the fruit, or whatever takes your fancy, on top and bake for 30-35 minutes until a knife inserted into the centre comes out clean. Place on a wire rack to cool. Dust with icing / confectioners sugar before serving. 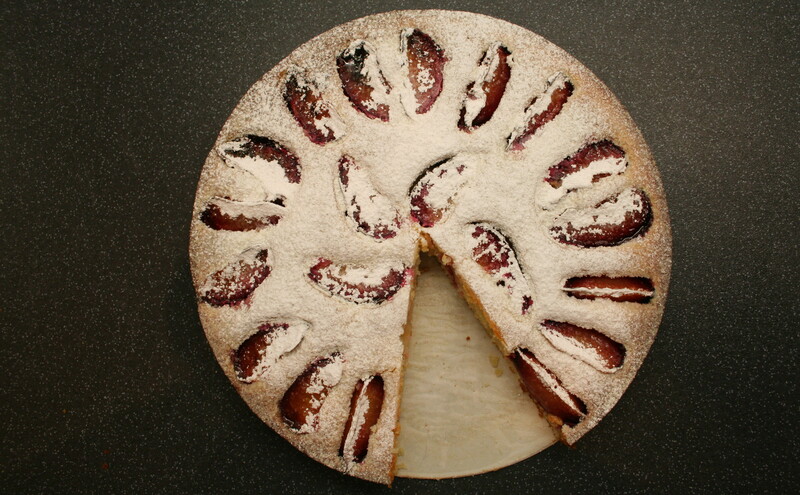 This entry was posted on Tuesday, February 28th, 2012 at 23:24	and tagged with fruit, plums, yoghurt and posted in cake, fruit. You can follow any responses to this entry through the RSS 2.0 feed. Your photos are fabby! Seriously talented my friend. Now you made me hungry – what to go and bake?